The organ dates back to 1865 when the organ was built by Robert Postill of York, who a year later refurbished the organ in Durham Cathedral. The organ was situated in an alcove on the north side of the sanctuary. In 1876 Thomas Harrison was called in to provide a proposal for a new organ; the reasons for a new organ were speculative in that it may have been due to the old organ’s ineffectiveness, or the church’s growing musical aspirations. The then current Durham architect, Charles Hodgson Fowler became involved and a new design of a new opening in the north chancel wall was devised – the location of the present organ. The organ now consists of a fine oak organ case with a bold array of patterned front pipes. The organ is a worthy survivor as an early Durham Harrison & Harrison instrument. Tonally however, it character is something of a surprise, being rather subtle and delicate, notably different from later Harrison instruments and from contemporary organs by other renowned builders. 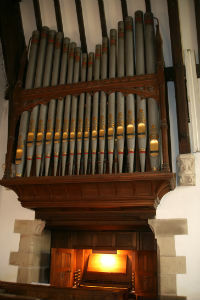 The organ was again refurbished in 2006 and is currently maintained by Lightfoot and Co. The synopsis above is based on a research report by Richard Hird dated December 2003.